So far, the Gulliver items I’ve collected are a Hula Doll from Hawaii, a Dala Horse from Sweden, and a Mummy’s Casket from Egypt. Pretty cool stuff! 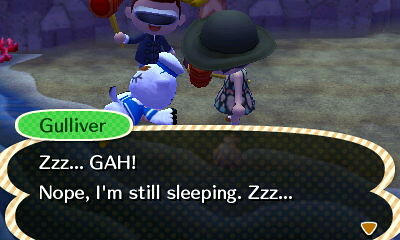 I wonder how many countries Gulliver plans to visit in this game? I love going to the Island with my boyfriend JDubz. 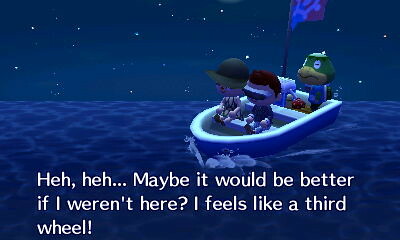 Kapp’n however seems a bit jealous lol! Playing on WIFI is so much fun! 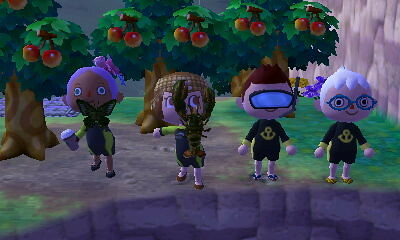 Recently Mayor JDubz and I visited with Mayors Vella and Kokuto. I didn’t post this photo last time, but it’s cute! This is a face-cutout standee from the Summer Solstice festival on 6/21. 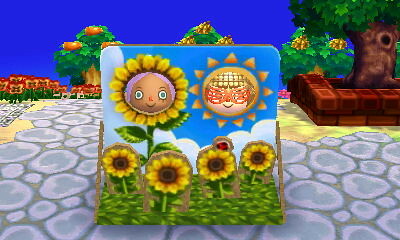 Vella is a happy sunflower, while I am a happy sun wearing Ladder Shades! 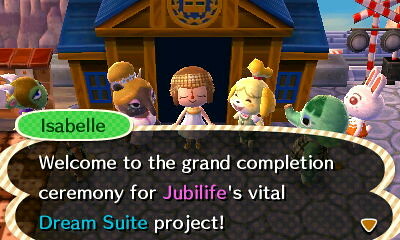 The Dream Suite is now open for business in Jubilife! 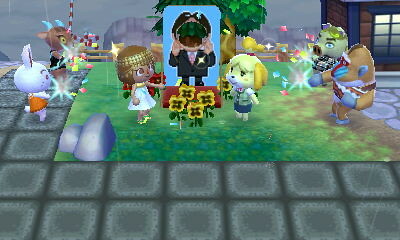 Oh hey, Reggie visited my Happy Home Showcase again! But he still doesn’t give me any ice cream so… I’m not impressed lol! 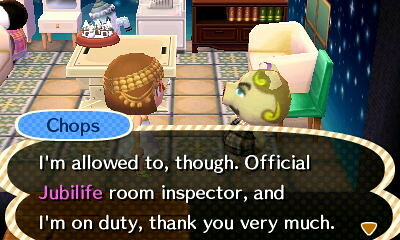 Chops thinks he’s the Official Jubilife room inspector… I mean, I appreciate that these guys want to help me out with my Mayor-ly duties. I just hope that they realize these are volunteer positions and that they won’t be getting paid or stealing my coveted Mayor’s chair at the Town Hall! YAY I’m starting to get a tan! 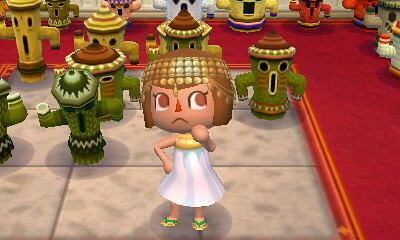 I’ve been spending a lot of time on the Island doing tours to stock up on medals and get my tan on. In the process, I’ve discovered that not all Island Tours take place in the daytime. 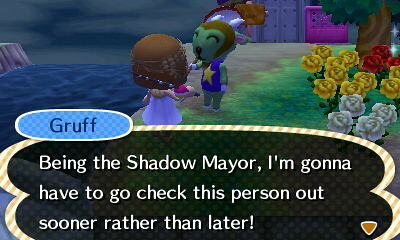 From what I’ve seen so far, there are more night-time Island Tours popping up than I’d realized. The Evening Firefly Tour, the Pro Diver Tour, and the Dangerous Fishing Tour all take place during night time, or during a thunderstorm. So don’t try to get a tan by doing those tours! So happy! 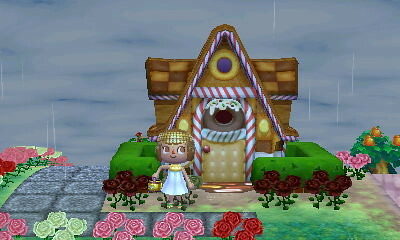 I’ve basically completed the my Sweets House exterior! 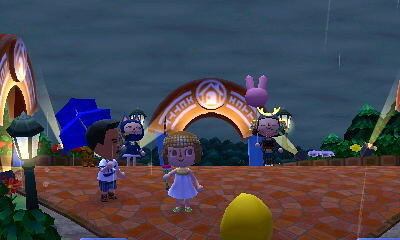 I have the house exterior, the roof, the door and the mailbox all with sweets style decor. 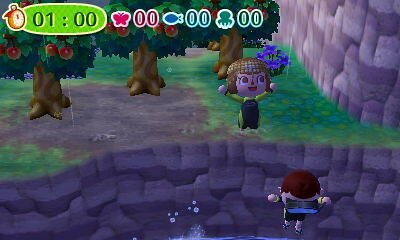 Don’t know if there’s a sweets fence or something… Anybody seen that in their Nook’s Housing store? On June 30th we completed the Face Cutout Standee Public Works project. Of course I replaced the existing image with a face cutout of Miyamoto, which I picked up in the Japanese Nintendo Dream Suite town! 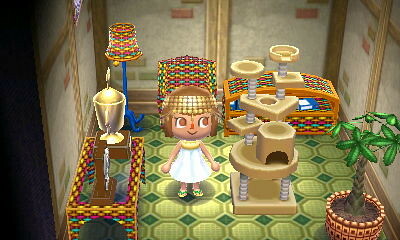 Yesterday I also got the latest Best Buy DLC… a “Cat Tower.” Now I need to somehow obtain the latest NL DLC, which is a shaved ice lamp! Don’t forget to pick up the monthly DLC from the Post Office as well! 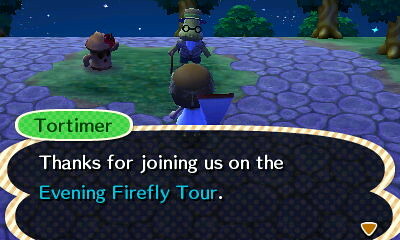 If you are looking to make new ACNL friends, I highly recommend you join ACUKE. 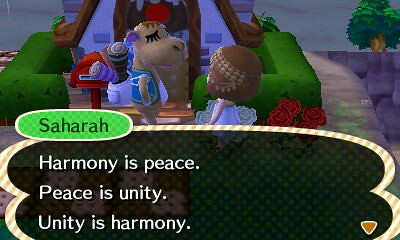 They have a lot of fun in-game meet ups planned, and you can chat w/members in the chatroom and forum. Definitely a great resource! There is a sweet fence — it looks like colorful boxes — with sugar. I’ve seen it in Nooks, just not for a few weeks.